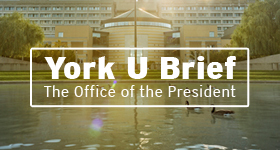 The York University Brief is the Office of the President’s monthly newsletter. It provides us with the opportunity to share stories about some of York’s best and brightest with our valued partners, so that you are able to celebrate our successes with us. 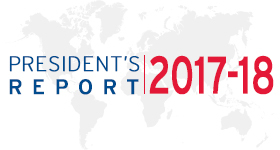 If you don’t already receive The York University Brief, you can sign up for it here. At York, we are curious and progressive by nature. These qualities fuel knowledge and discovery within our community and enable success and groundbreaking research in a wide range of subject areas. We take pride in our innovative community, and look forward to sharing more about it with you.